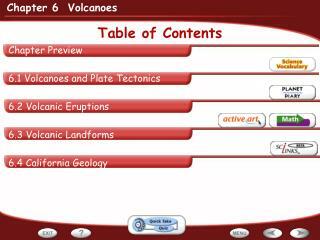 Chapter 6 Volcanoes. 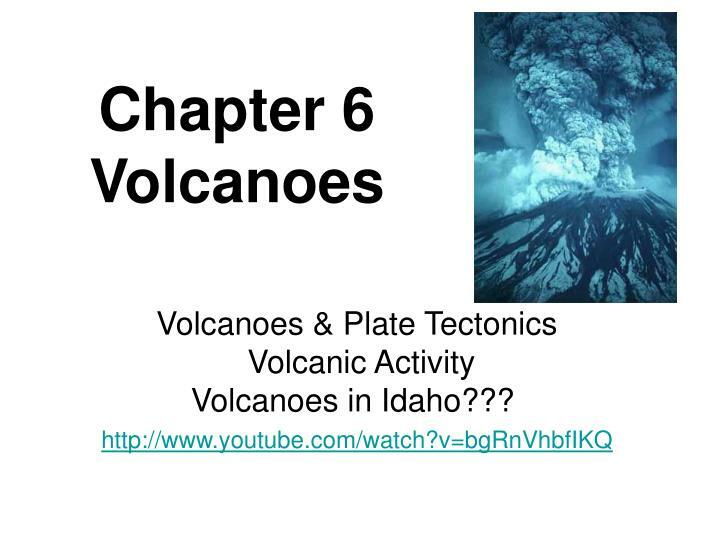 Volcanoes & Plate Tectonics Volcanic Activity Volcanoes in Idaho??? http://www.youtube.com/watch?v=bgRnVhbfIKQ. Student Objectives. 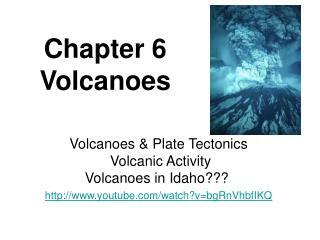 Volcanoes & Plate Tectonics Volcanic ActivityVolcanoes in Idaho??? 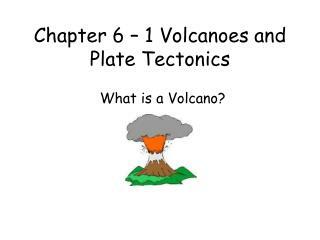 Students will discuss where volcanoes generally form, specifically name the three types of locations, be able to draw picture showing how they form, and how it ties into plate tectonics. 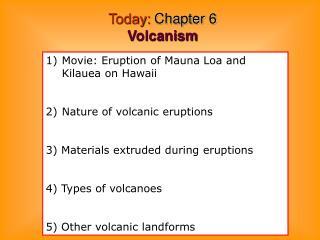 Students will distinguish between magma and lava, and define pyroclastic. 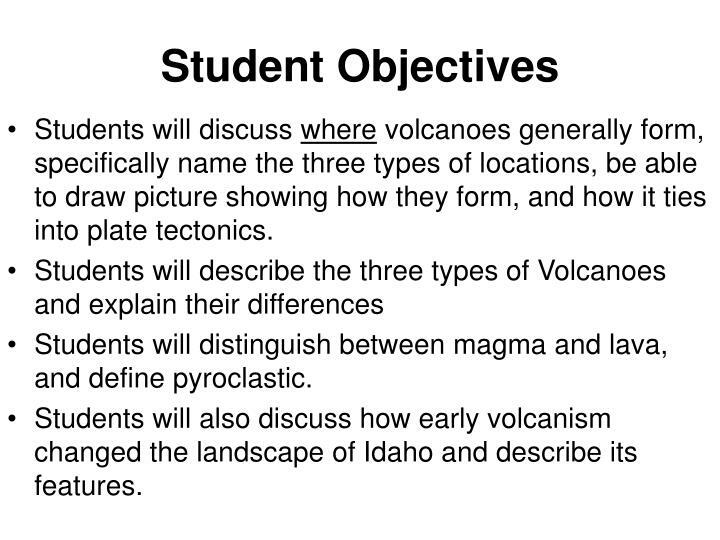 Students will also discuss how early volcanism changed the landscape of Idaho and describe its features. 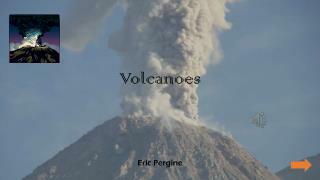 The Eruption of a volcano is among the most dangerous and awe inspiring events on earth! 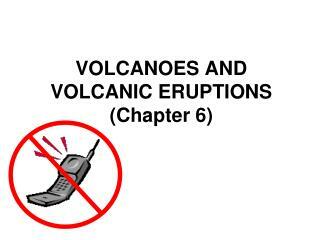 A volcano is a weak spot in the crust where molten magma comes to the surface. 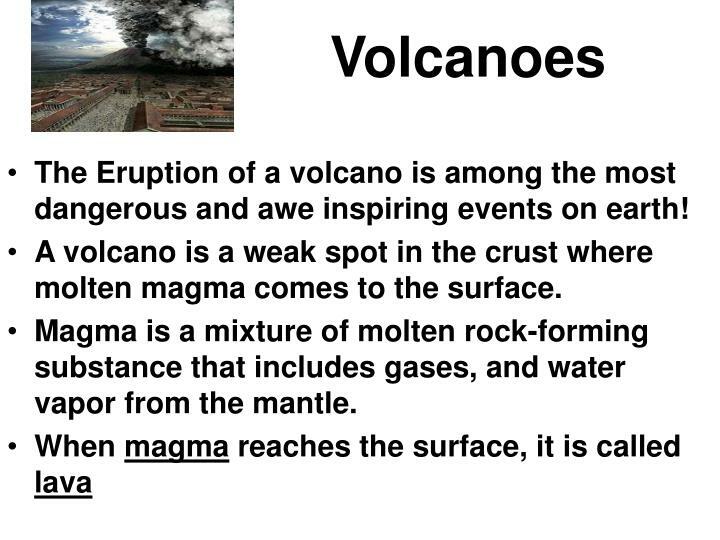 Magma is a mixture of molten rock-forming substance that includes gases, and water vapor from the mantle. Mt. 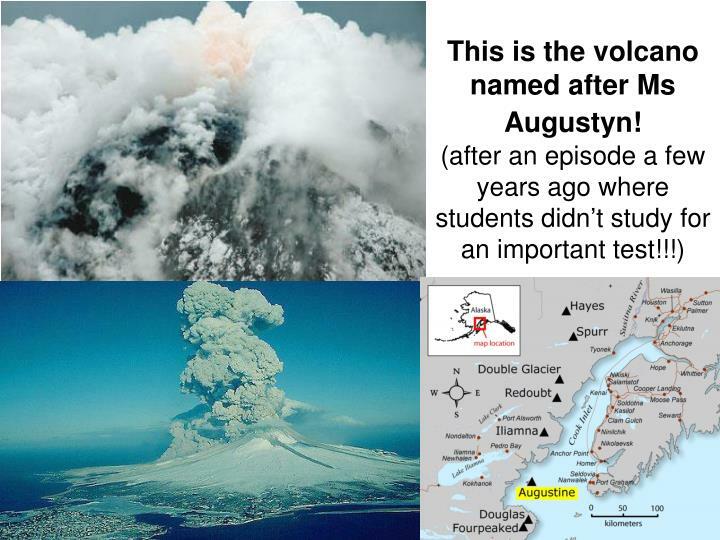 Vesuvius – The Unexpected! 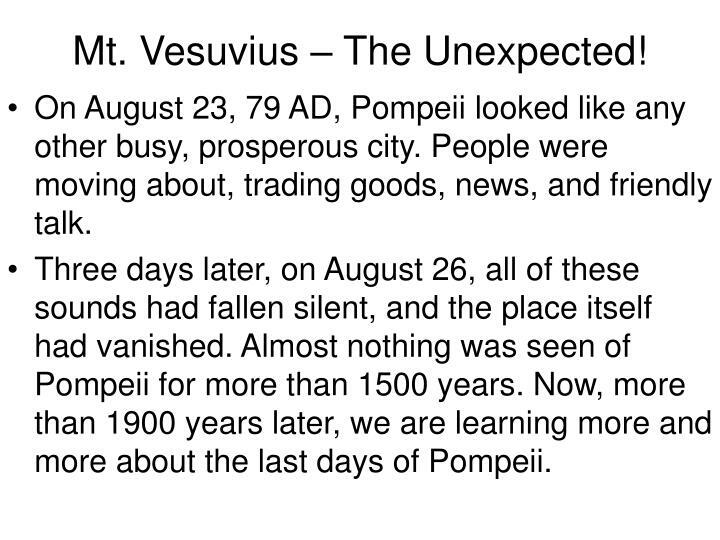 On August 23, 79 AD, Pompeii looked like any other busy, prosperous city. People were moving about, trading goods, news, and friendly talk. Three days later, on August 26, all of these sounds had fallen silent, and the place itself had vanished. Almost nothing was seen of Pompeii for more than 1500 years. Now, more than 1900 years later, we are learning more and more about the last days of Pompeii. What happened to Pompeii preserved a treasury of information about life in the ancient Roman Empire. 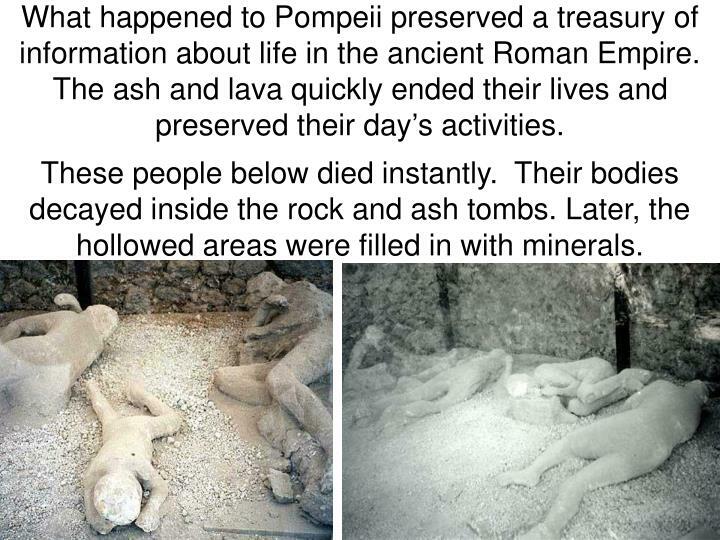 The ash and lava quickly ended their lives and preserved their day’s activities.These people below died instantly. Their bodies decayed inside the rock and ash tombs. Later, the hollowed areas were filled in with minerals. 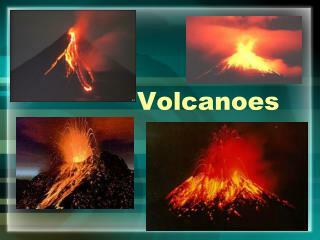 There are about 600 active volcanoes on land. Many more lie beneath the sea. 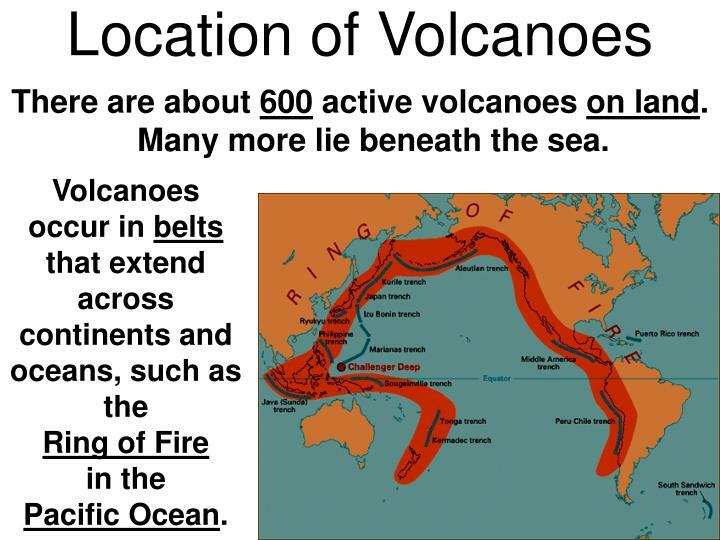 Volcanoes occur in belts that extend across continents and oceans, such as the Ring of Firein the Pacific Ocean. 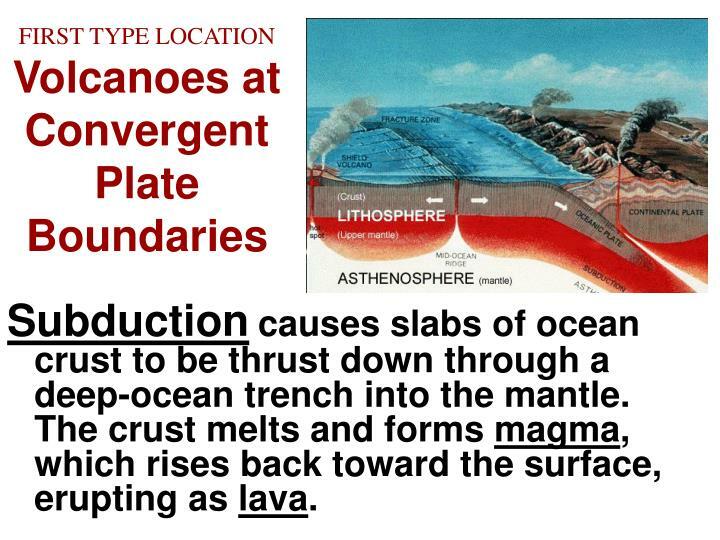 Subductioncauses slabs of ocean crust to be thrust down through a deep-ocean trench into the mantle. The crust melts and forms magma, which rises back toward the surface, erupting as lava. 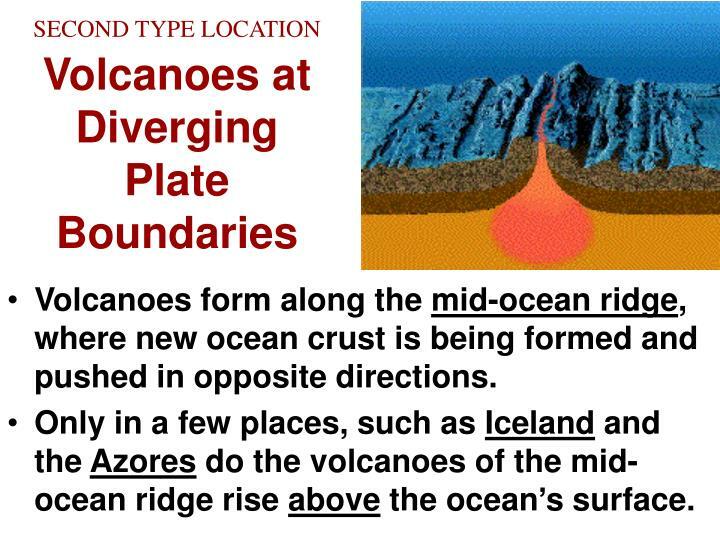 Volcanoes form along the mid-ocean ridge, where new ocean crust is being formed and pushed in opposite directions. Only in a few places, such as Iceland and the Azores do the volcanoes of the mid-ocean ridge rise above the ocean’s surface. Iceland is one the very few places where the mid-oceanic ridge rises above ocean’s surface. This is a common sight there! 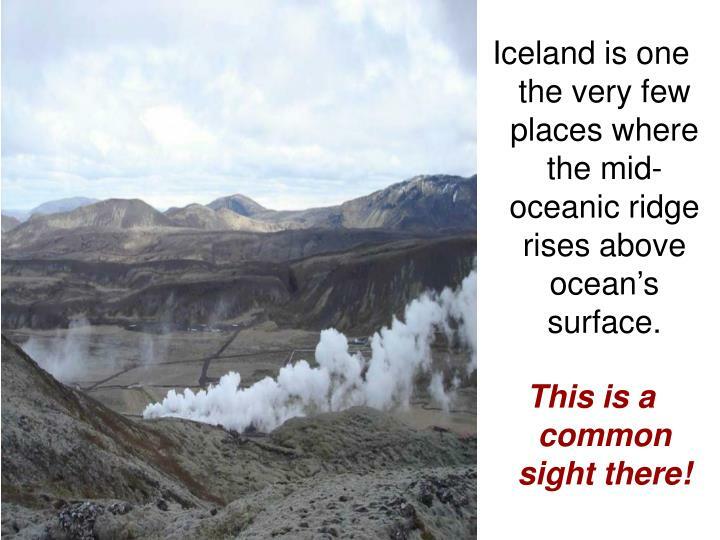 A hot spot is an area where magma from deep within the mantle melts through the crust like a blow torch. 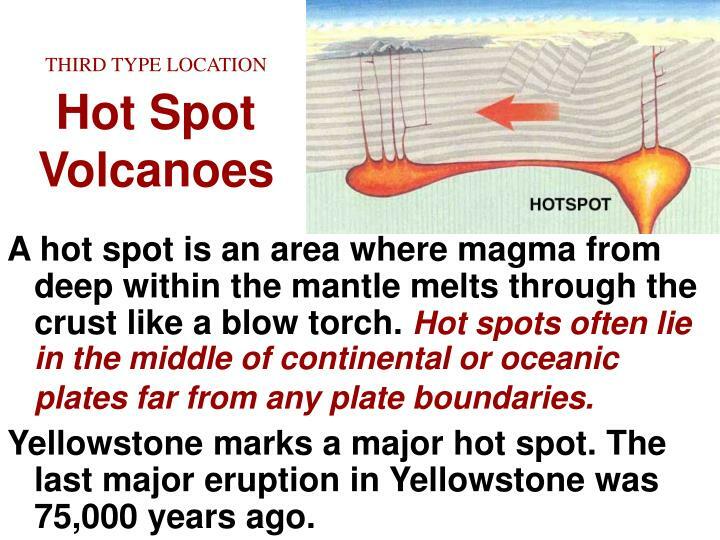 Hot spots often lie in the middle of continental or oceanic plates far from any plate boundaries. Yellowstone marks a major hot spot. The last major eruption in Yellowstone was 75,000 yearsago. 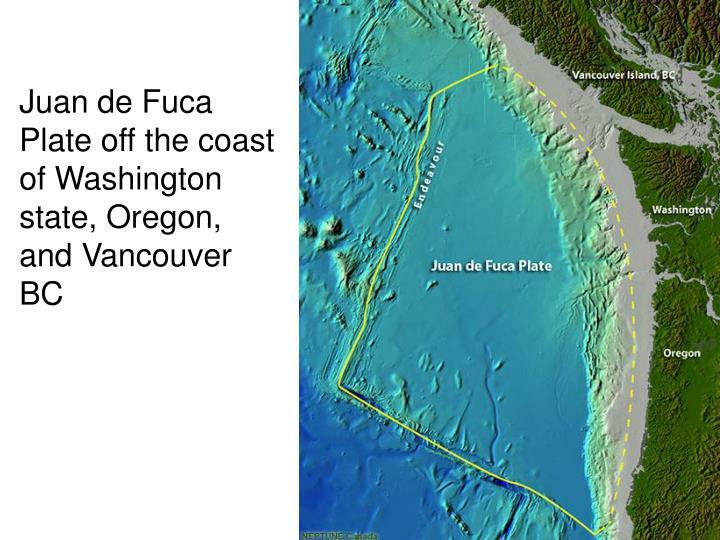 The Juan de Fuca is an interesting area for tectonic research due to several unique characteristics. 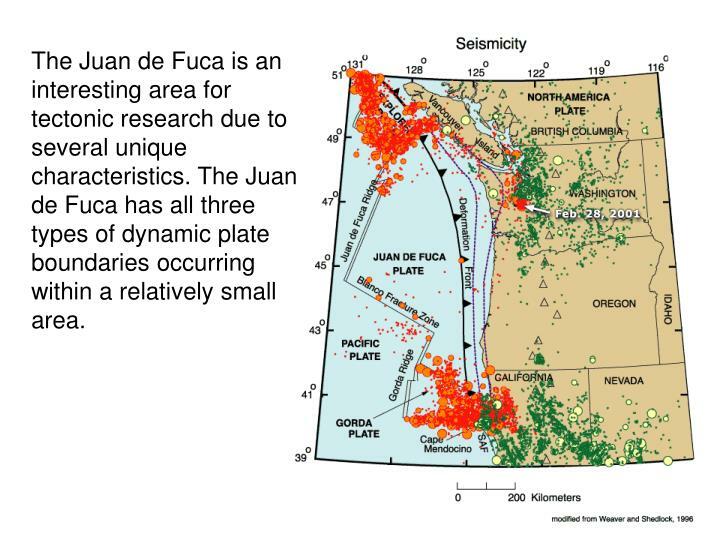 The Juan de Fuca has all three types of dynamic plate boundaries occurring within a relatively small area. 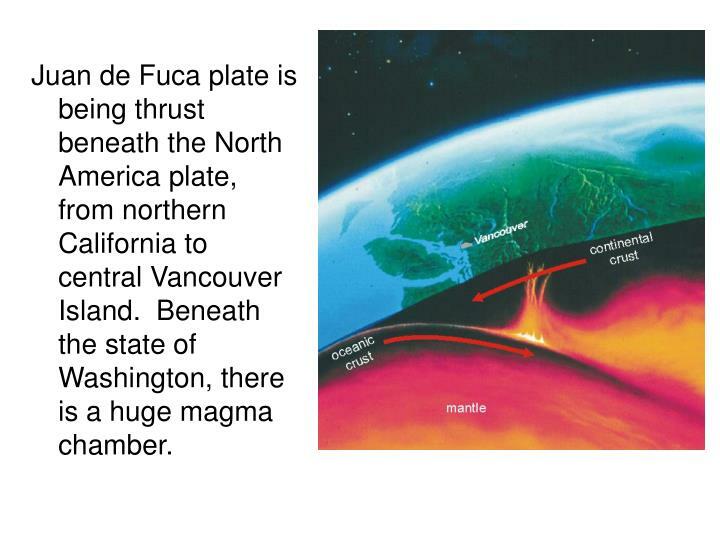 Juan de Fuca plate is being thrust beneath the North America plate, from northern California to central Vancouver Island. Beneath the state of Washington, there is a huge magma chamber. 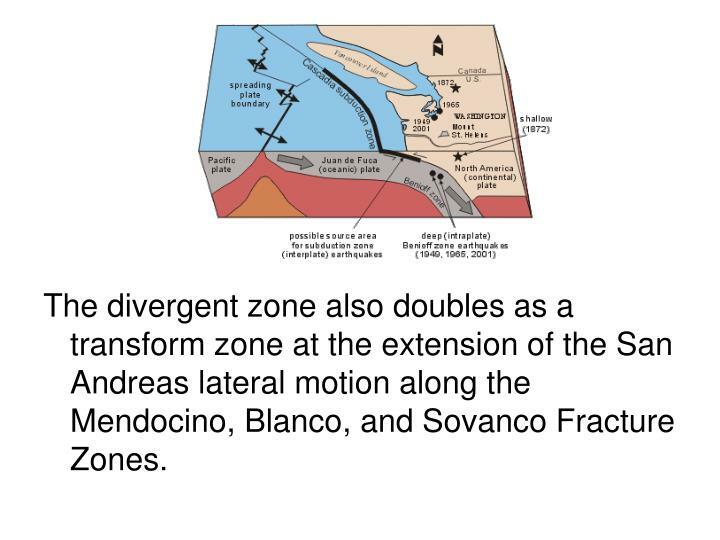 The divergent zone also doubles as a transform zone at the extension of the San Andreas lateral motion along the Mendocino, Blanco, and Sovanco Fracture Zones. Just like CO2 trapped in a can of pop, the dissolved gases are under lots of pressure. A volcano erupts when an opening develops in weak rock on the surface. 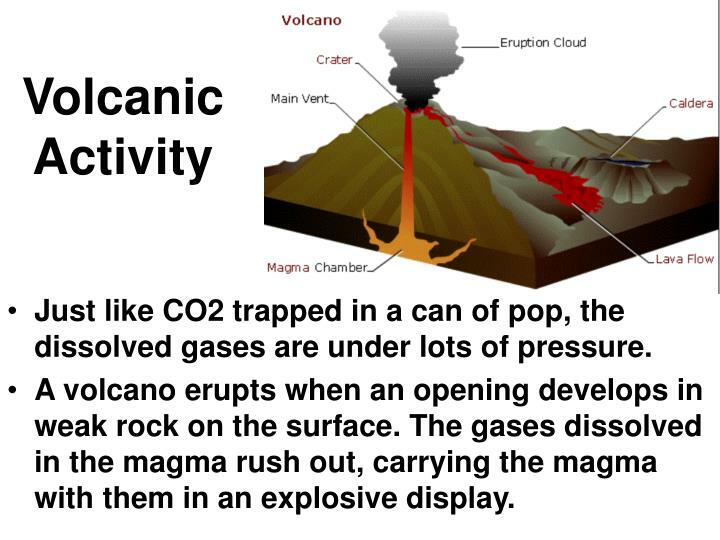 The gases dissolved in the magma rush out, carrying the magma with them in an explosive display. The Snake River Plain extends 400 miles (650 km) westward from northwest Wyoming to the Idaho-Oregon border. The Snake River Plain is a broad, flat depression, which covers one quarter of the state of Idaho. The geysers, hot springs, and bubbling mud pots of Yellowstone National Park indicate there is extra heat beneath the northwest corner of Wyoming. The heat is from a hot spot beneath Yellowstone that causes all the sensational features in Yellowstone. 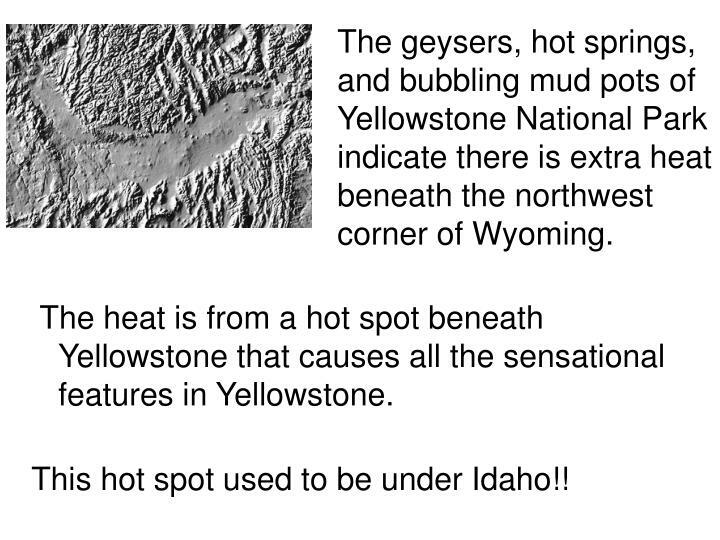 This hot spot used to be under Idaho!! 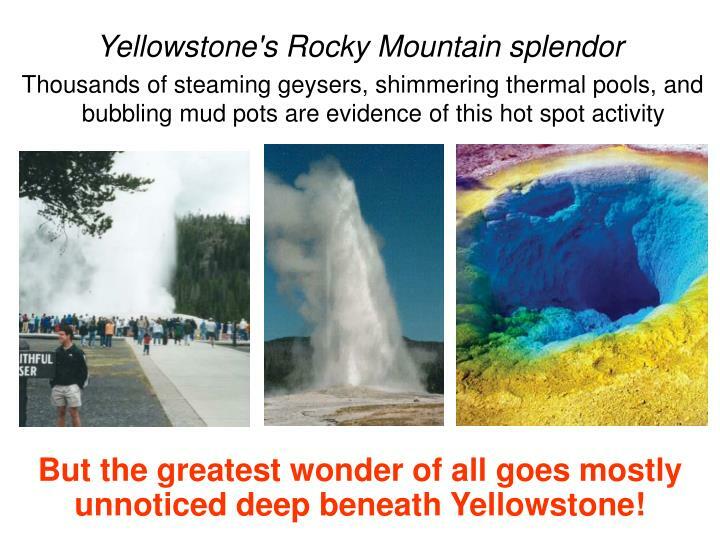 But the greatest wonder of all goes mostly unnoticed deep beneath Yellowstone! What’s going on below Yellowstone? Hidden underground, powerful volcanic, tectonic, and hydrothermal forces are continually reshaping the landscape of Yellowstone. 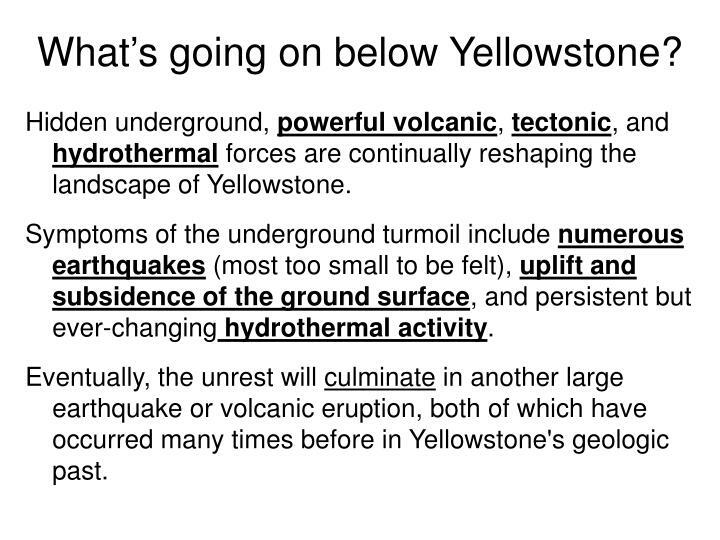 Symptoms of the underground turmoil include numerous earthquakes (most too small to be felt), uplift and subsidence of the ground surface, and persistent but ever-changing hydrothermal activity. 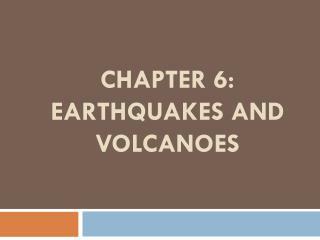 Eventually, the unrest will culminate in another large earthquake or volcanic eruption, both of which have occurred many times before in Yellowstone's geologic past. 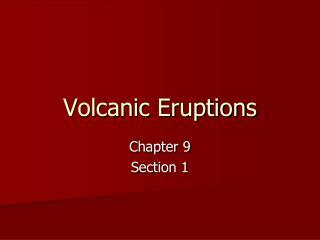 The largest and most explosive volcanic eruptions eject tens to hundreds of cubic kilometers of magma onto the Earth's surface. 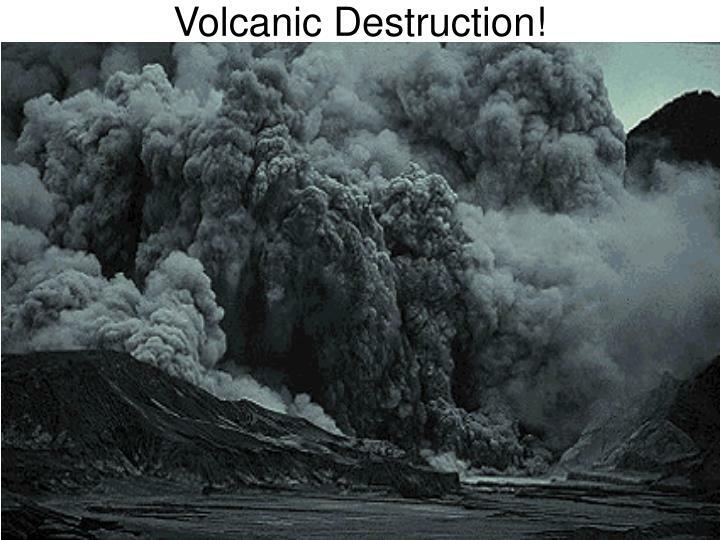 When such a large volume of magma is removed from beneath a volcano, the ground subsides or collapses into the emptied space, to form a huge depression called a caldera. 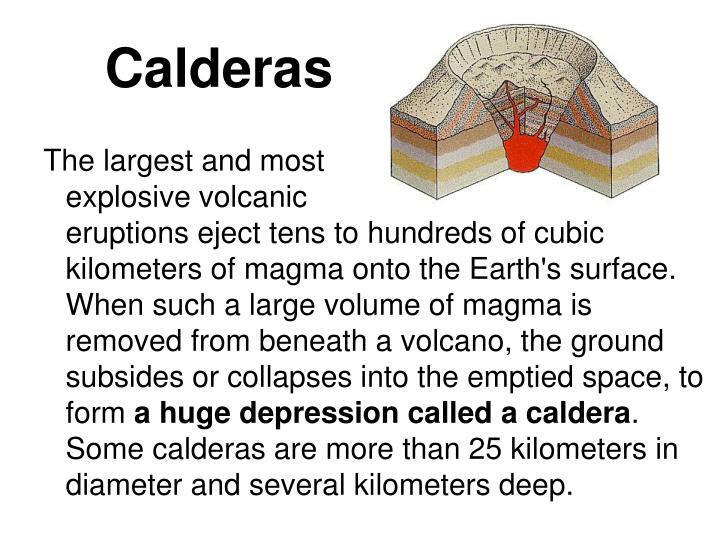 Some calderas are more than 25 kilometers in diameter and several kilometers deep. Craters of the Moon is a volcanic field of old calderas. 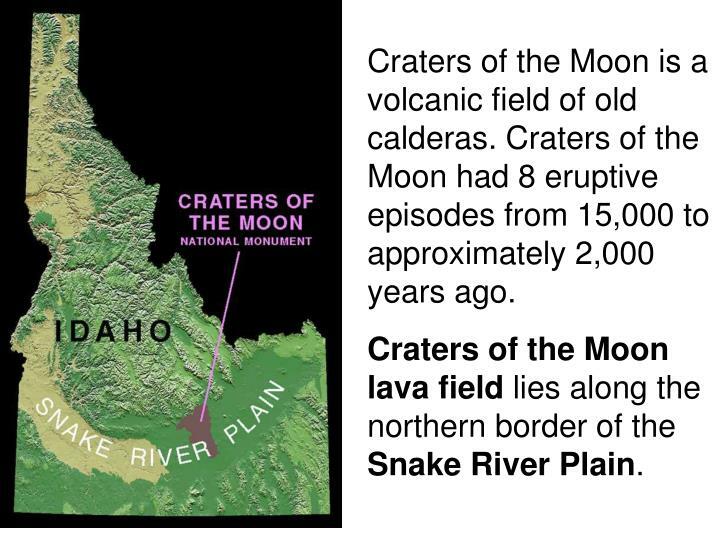 Craters of the Moon had 8 eruptive episodes from 15,000 to approximately 2,000 years ago. Craters of the Moon lava field lies along the northern border of the Snake River Plain. Eight times in the past 15,000 years lava poured from cracks which opened along this weak spot in the earth's crust. Expanding gases in the lava ejected rocks hundreds of feet into the air. 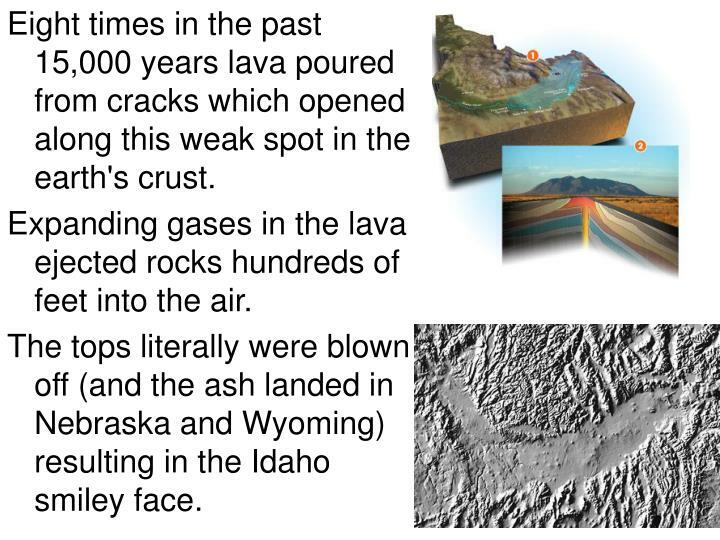 The tops literally were blown off (and the ash landed in Nebraska and Wyoming) resulting in the Idaho smiley face. 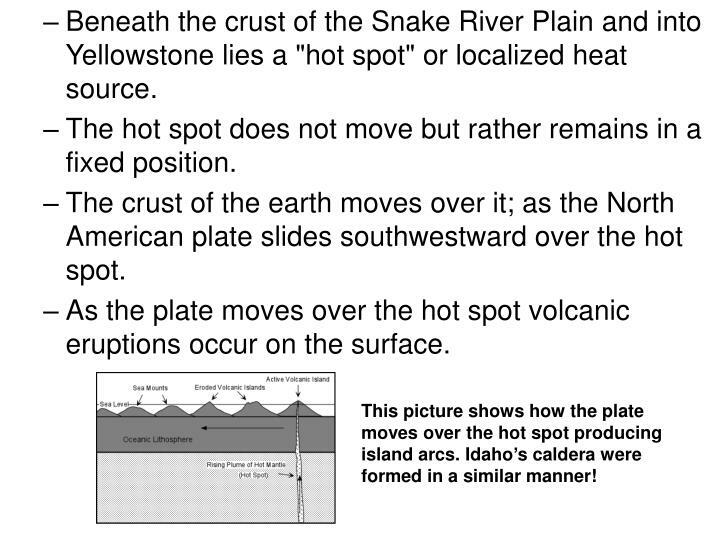 Beneath the crust of the Snake River Plain and into Yellowstone lies a "hot spot" or localized heat source. The hot spot does not move but rather remains in a fixed position. The crust of the earth moves over it; as the North American plate slides southwestward over the hot spot. 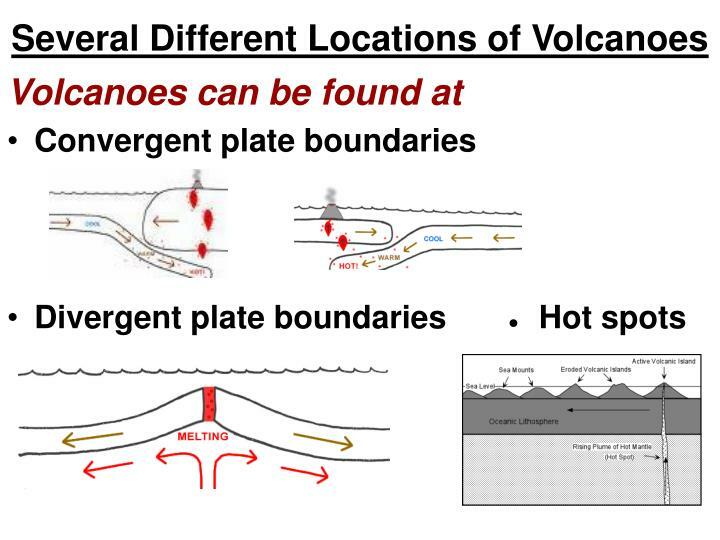 As the plate moves over the hot spot volcanic eruptions occur on the surface. This picture shows how the plate moves over the hot spot producing island arcs. 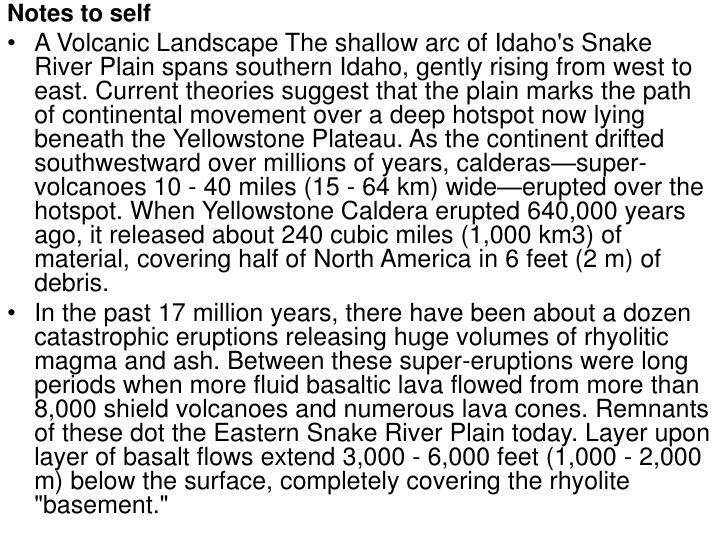 Idaho’s caldera were formed in a similar manner! 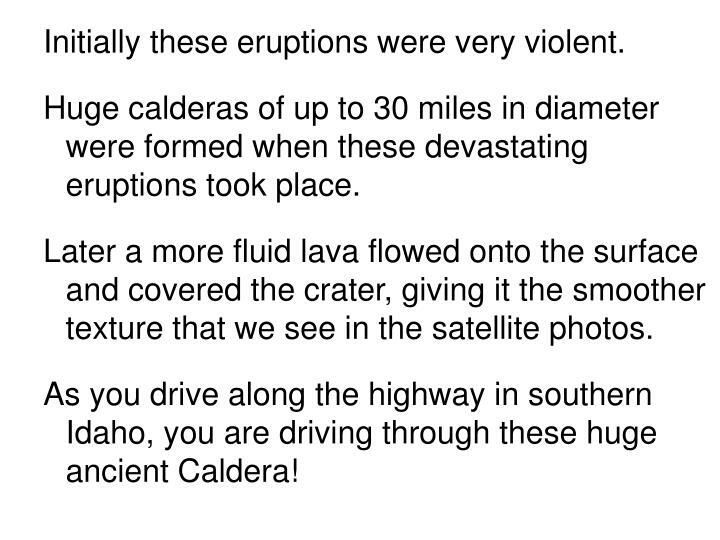 Initially these eruptions were very violent. 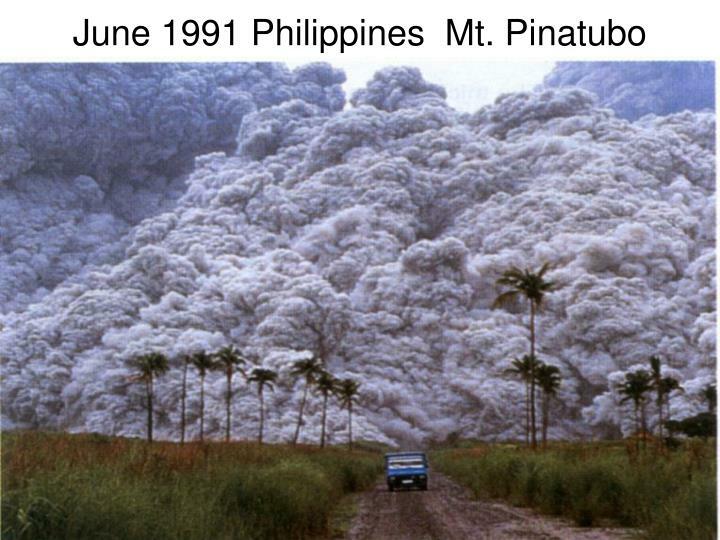 Huge calderas of up to 30 miles in diameter were formed when these devastating eruptions took place. Later a more fluid lava flowed onto the surface and covered the crater, giving it the smoother texture that we see in the satellite photos. As you drive along the highway in southern Idaho, you are driving through these huge ancient Caldera! Calderas become progressively younger from west to east. 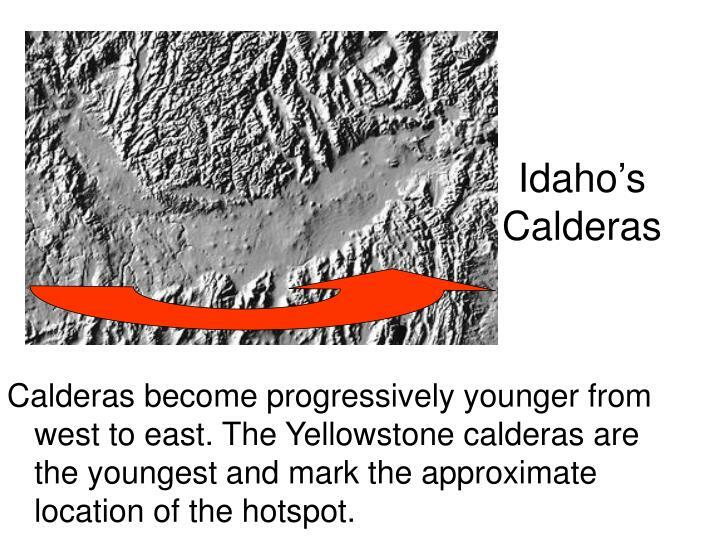 The Yellowstone calderas are the youngest and mark the approximate location of the hotspot. The lake was formed after the collapse of an ancient volcano, posthumously named Mount Mazama. This volcano violently erupted approximately 7,700 years ago. 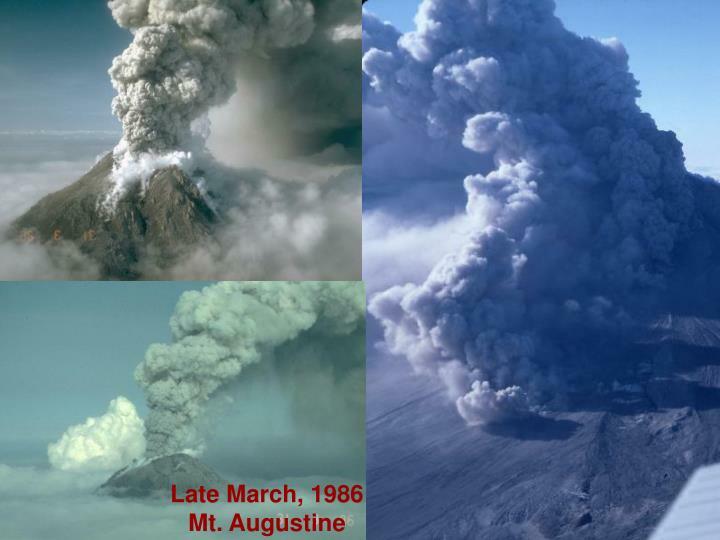 That eruption was 42 times as powerful as the 1980 eruption of Mt. St. Helens. The basin or caldera was formed after the top 5,000 feet of the volcano collapsed. 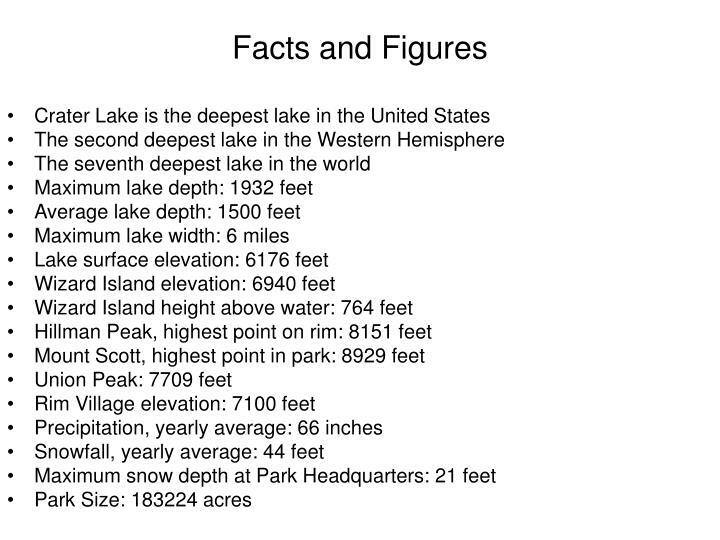 Subsequent lava flows sealed the bottom, allowing the caldera to fill with approximately 4.6 trillion gallons of water from rainfall and snow melt, to create the seventh deepest lake in the world at 1,932 feet. Rolling mountains, volcanic peaks, and evergreen forests surround this enormous, high Cascade Range lake, recognized worldwide as a scenic wonder. On summer days, neither words or photographs can capture Crater Lake's remarkable blueness. 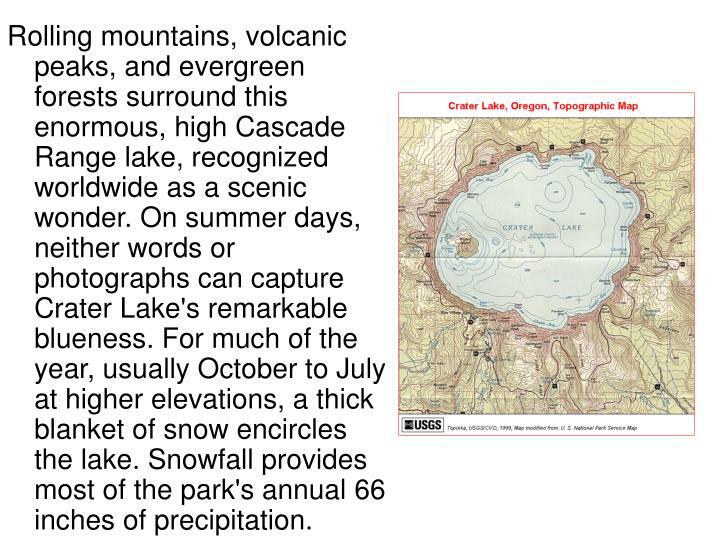 For much of the year, usually October to July at higher elevations, a thick blanket of snow encircles the lake. Snowfall provides most of the park's annual 66 inches of precipitation. 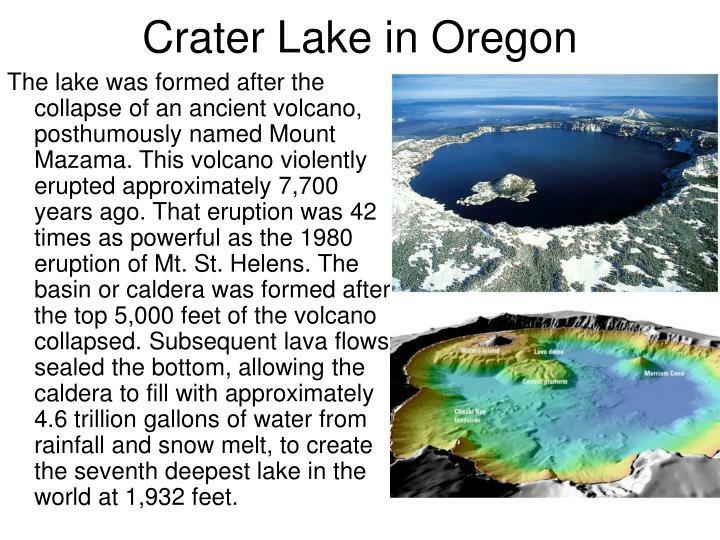 Crater Lake rarely freezes over completely; it last did in 1949. Heat from the summer sun stored in the immense body of water retards ice formation throughout the winter. On the earth clock, natural forces only recently constructed this landscape. 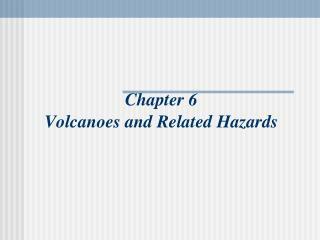 Lava flows first formed a high plateau base on which explosive eruptions then built the Cascade volcanoes. 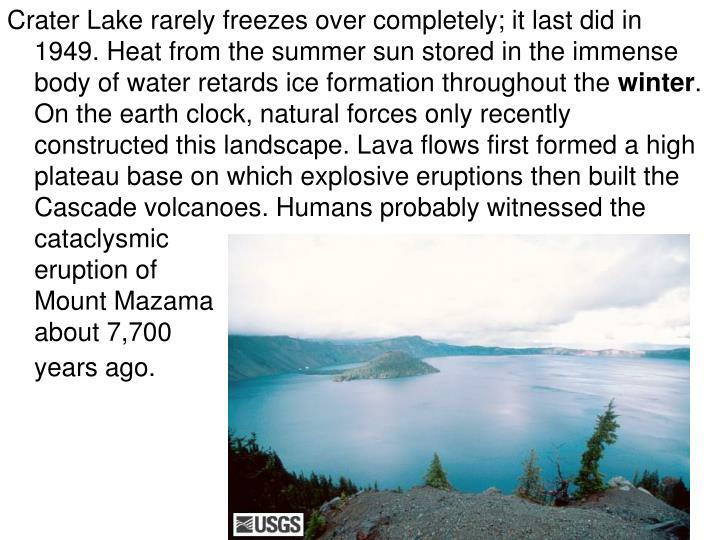 Humans probably witnessed the cataclysmic eruption of Mount Mazama about 7,700 years ago. 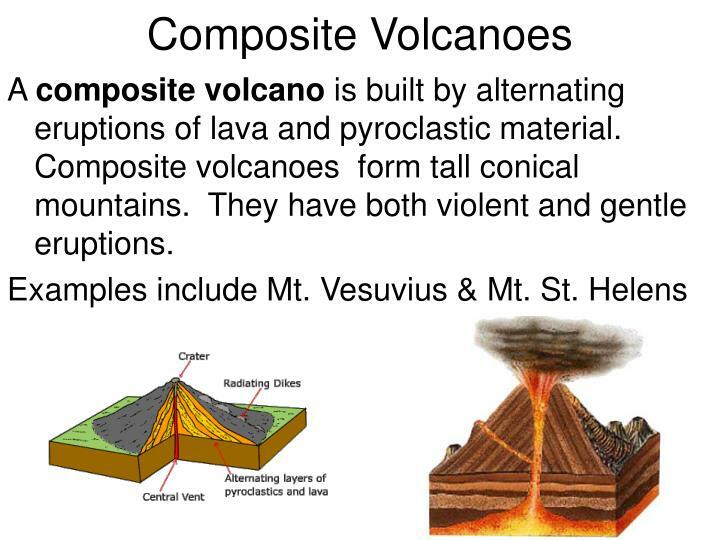 A composite volcano is built by alternating eruptions of lava and pyroclastic material. Composite volcanoes form tall conical mountains. They have both violent and gentle eruptions. 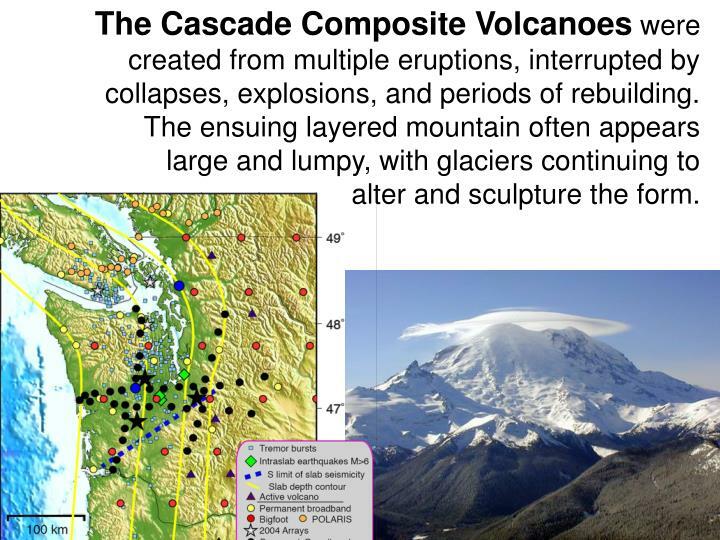 The Cascade Composite Volcanoes were created from multiple eruptions, interrupted by collapses, explosions, and periods of rebuilding. The ensuing layered mountain often appears large and lumpy, with glaciers continuing to alter and sculpture the form. 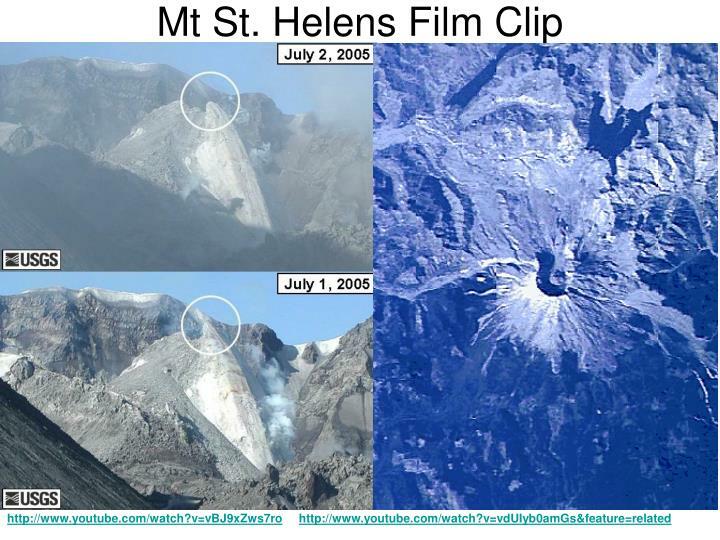 Mt St Helens in eruption is shown in the this photo. Mt. 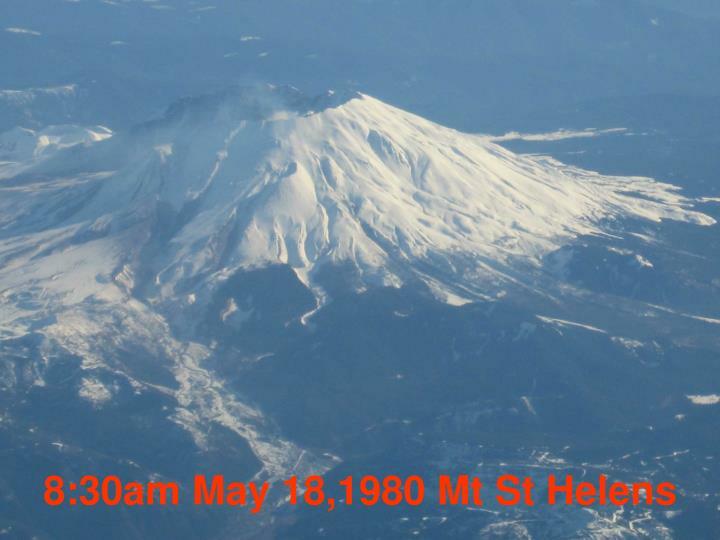 St. Helens had a nearly perfect symmetrical form previous to the 1980 eruption. This indicates the youth of this volcano. 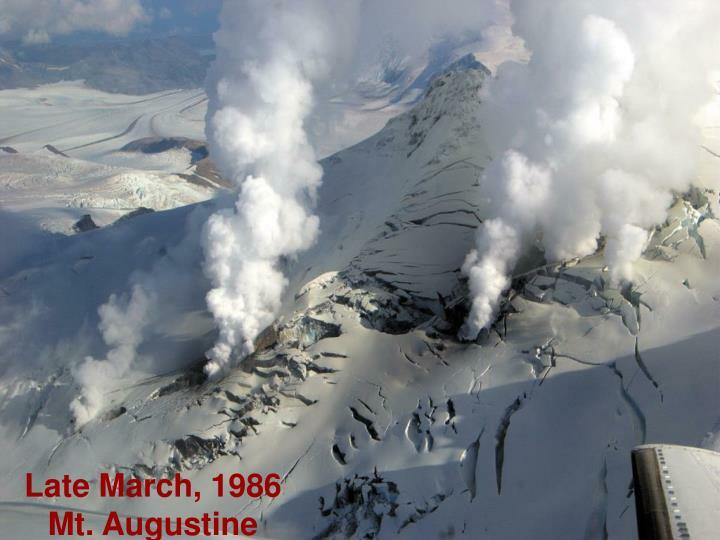 St. Helens was very active during the 19th century but remained quiet until 1980. Mt Shasta stands nearly as tall as Mt. Rainier and like Mt. Rainier it poses great dangers for the surrounding towns. Mt. 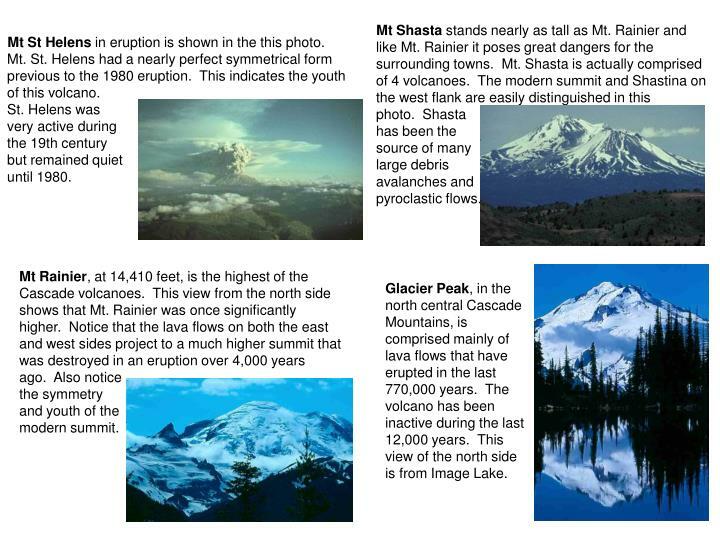 Shasta is actually comprised of 4 volcanoes. The modern summit and Shastina on the west flank are easily distinguished in this photo. Shasta has been the source of many large debris avalanches andpyroclastic flows. Mt Rainier, at 14,410 feet, is the highest of the Cascade volcanoes. This view from the north side shows that Mt. Rainier was once significantly higher. Notice that the lava flows on both the east and west sides project to a much higher summit that was destroyed in an eruption over 4,000 years ago. Also notice the symmetry and youth of the modern summit. Glacier Peak, in the north central Cascade Mountains, is comprised mainly of lava flows that have erupted in the last 770,000 years. 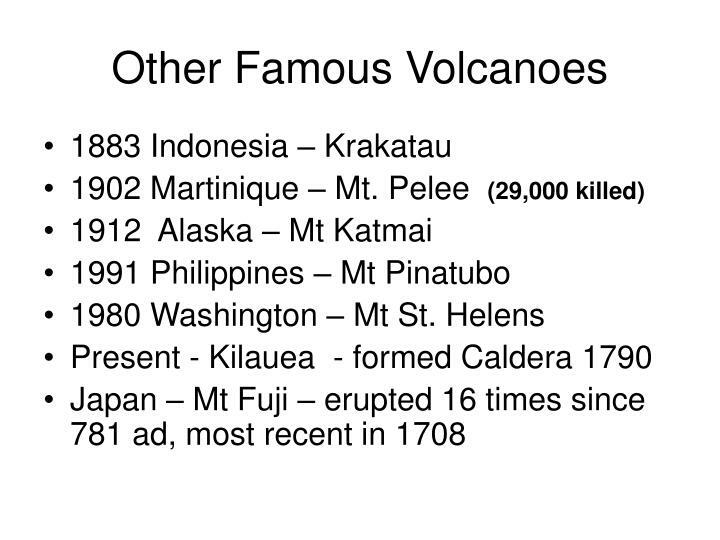 The volcano has been inactive during the last 12,000 years. This view of the north side is from Image Lake. 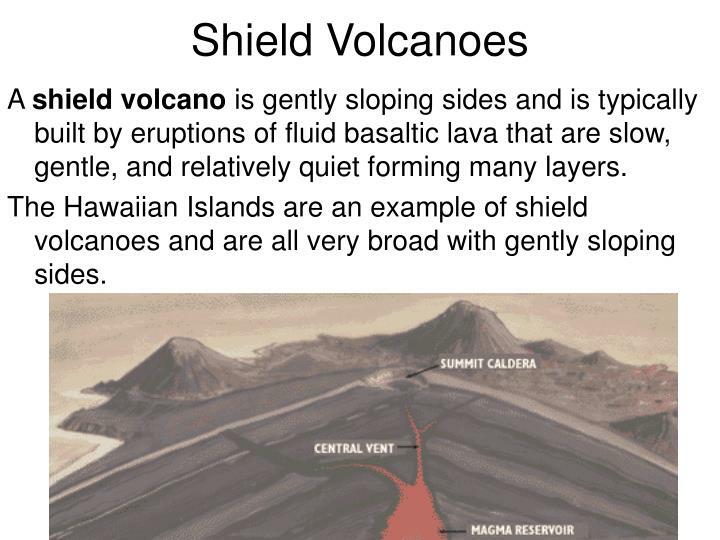 A shield volcano is gently sloping sides and is typically built by eruptions of fluid basaltic lava that are slow, gentle, and relatively quiet forming many layers. The Hawaiian Islands are an example of shield volcanoes and are all very broad with gently sloping sides. Earth is not the only place in the solar system to have shield volcanoes. Venus and Jupiter’s moon Io have tons of them. 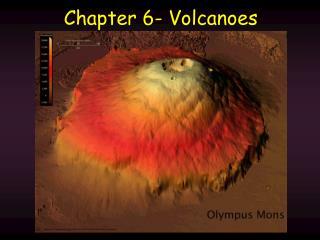 But the best example of a shield volcano that we know of is Olympus Mons on Mars. 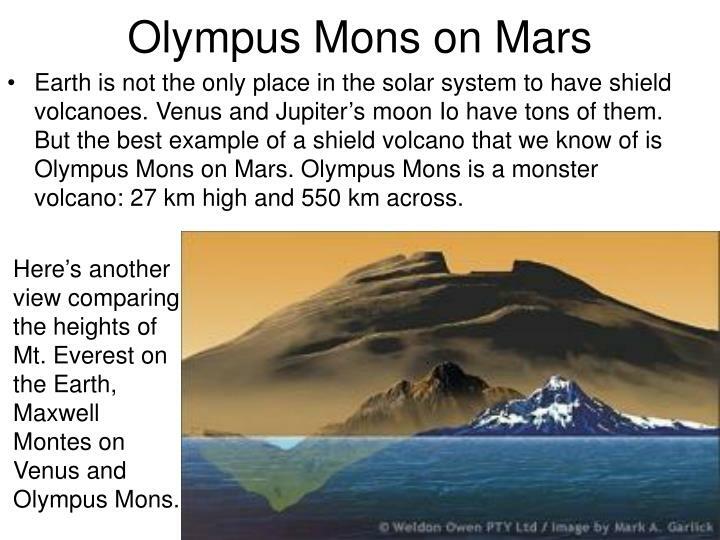 Olympus Mons is a monster volcano: 27 km high and 550 km across. Here’s another view comparing the heights of Mt. 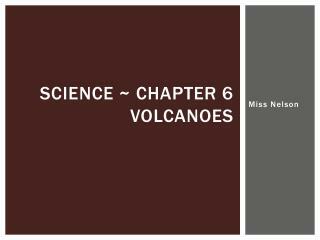 Everest on the Earth, Maxwell Montes on Venus and Olympus Mons. Cinder cones are constructed from the deposition of cinders and other pyroclastic material and usually have sudden, violent eruptions. 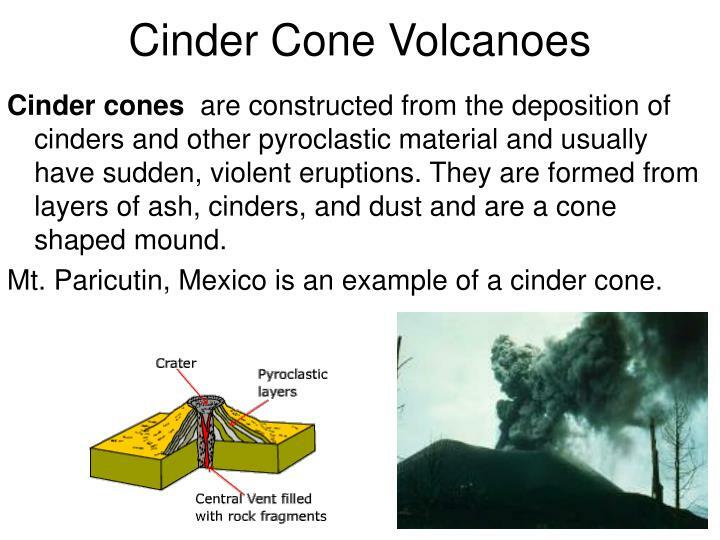 They are formed from layers of ash, cinders, and dust and are a cone shaped mound. Mt. Paricutin, Mexico is an example of a cinder cone. Magmais molten rock found beneath the earth's surface. Magma is extruded on to the surface as lava. Lava flows are streams of molten rock material extruded onto the surface of the earth. 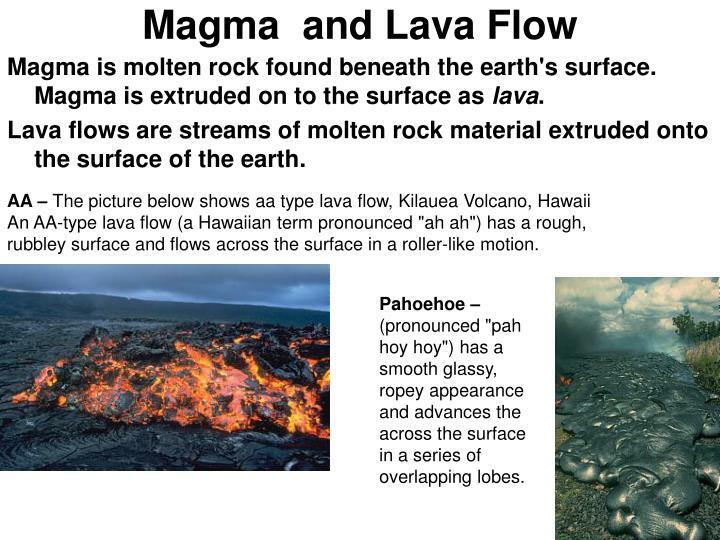 An AA-type lava flow (a Hawaiian term pronounced "ah ah") has a rough, rubbley surface and flows across the surface in a roller-like motion. Pahoehoe –(pronounced "pah hoy hoy") has a smooth glassy, ropey appearance and advances the across the surface in a series of overlapping lobes. 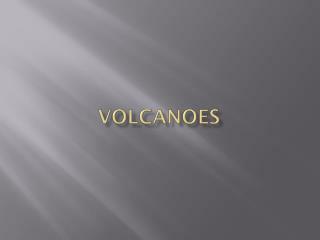 Where do volcanoes generally form? What are the three types of locations? 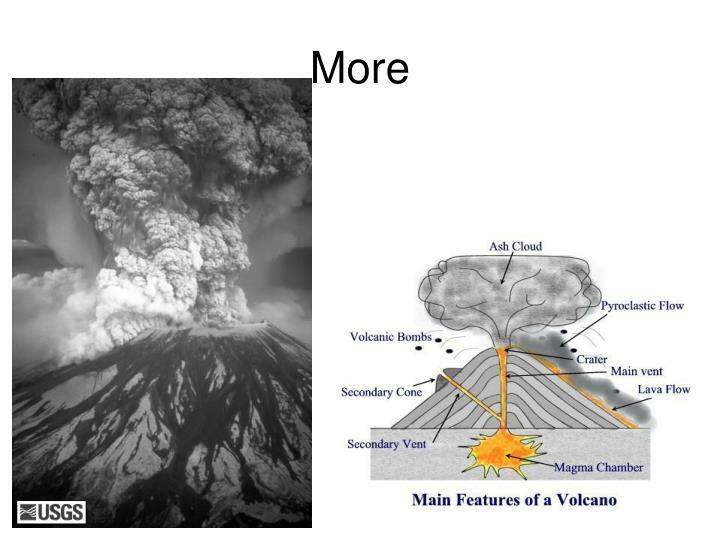 How do volcanoes tie into plate tectonics? 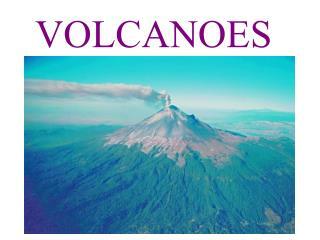 What are the three (four) types of volcanoes? 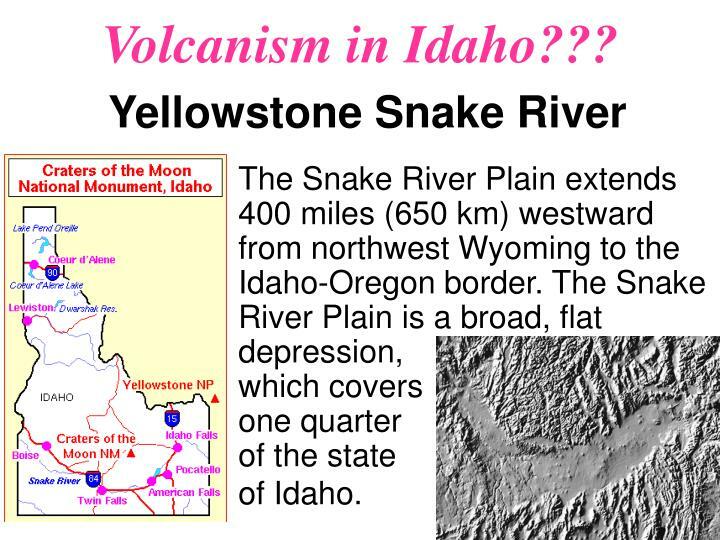 How do we know that Idaho had ancient volcanoes? What kind of “volcano-in-the-making” is found under Yellowstone National Park? A Volcanic Landscape The shallow arc of Idaho's Snake River Plain spans southern Idaho, gently rising from west to east. Current theories suggest that the plain marks the path of continental movement over a deep hotspot now lying beneath the Yellowstone Plateau. As the continent drifted southwestward over millions of years, calderas—super-volcanoes 10 - 40 miles (15 - 64 km) wide—erupted over the hotspot. When Yellowstone Caldera erupted 640,000 years ago, it released about 240 cubic miles (1,000 km3) of material, covering half of North America in 6 feet (2 m) of debris. In the past 17 million years, there have been about a dozen catastrophic eruptions releasing huge volumes of rhyolitic magma and ash. Between these super-eruptions were long periods when more fluid basaltic lava flowed from more than 8,000 shield volcanoes and numerous lava cones. Remnants of these dot the Eastern Snake River Plain today. Layer upon layer of basalt flows extend 3,000 - 6,000 feet (1,000 - 2,000 m) below the surface, completely covering the rhyolite "basement." 1. 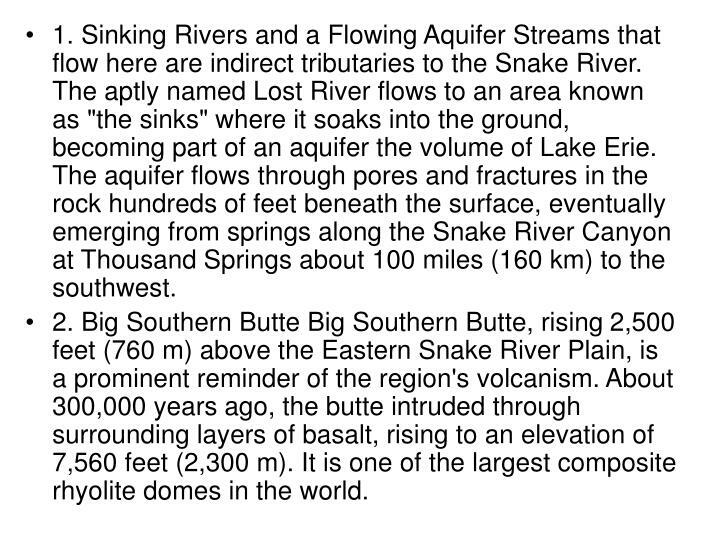 Sinking Rivers and a Flowing Aquifer Streams that flow here are indirect tributaries to the Snake River. The aptly named Lost River flows to an area known as "the sinks" where it soaks into the ground, becoming part of an aquifer the volume of Lake Erie. The aquifer flows through pores and fractures in the rock hundreds of feet beneath the surface, eventually emerging from springs along the Snake River Canyon at Thousand Springs about 100 miles (160 km) to the southwest. 2. Big Southern Butte Big Southern Butte, rising 2,500 feet (760 m) above the Eastern Snake River Plain, is a prominent reminder of the region's volcanism. About 300,000 years ago, the butte intruded through surrounding layers of basalt, rising to an elevation of 7,560 feet (2,300 m). It is one of the largest composite rhyolite domes in the world. 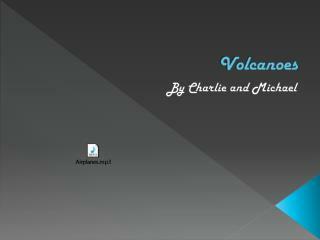 VOLCANOES -. 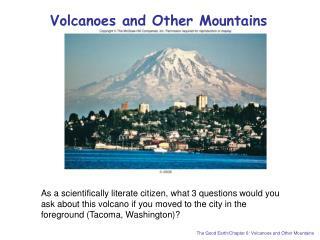 what is a volcano?. 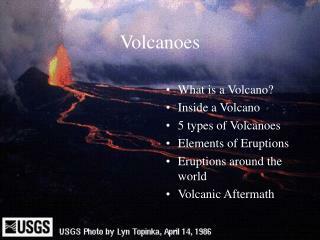 a volcano is a weak spot in the crust where magma comes to the surface. 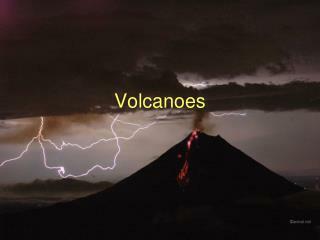 volcanoes are a constructive force (adds new rock to existing crust). 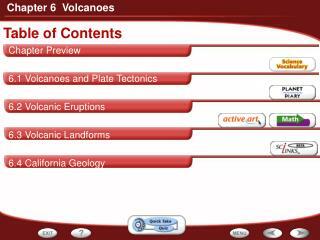 http://gvc1007.gvc10.virtualclassroom.org/volcanoes.html. 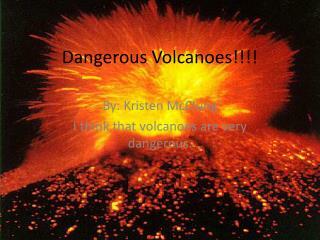 Volcanoes -. 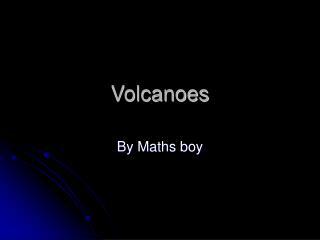 by maths boy. 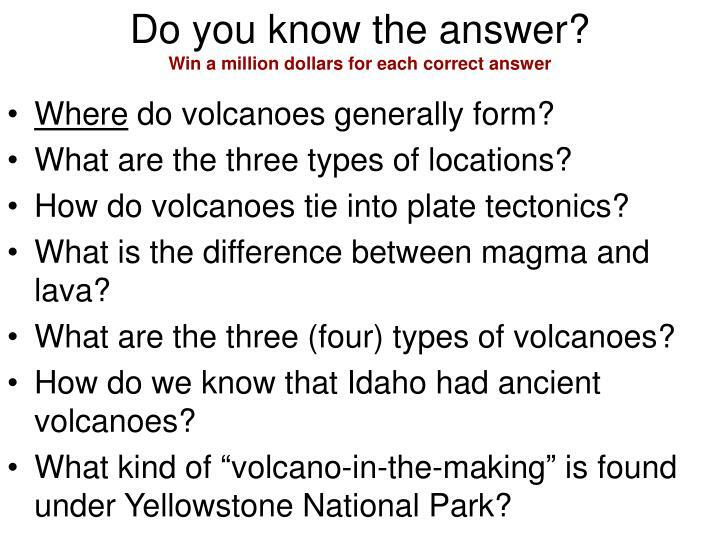 what is a volcano. 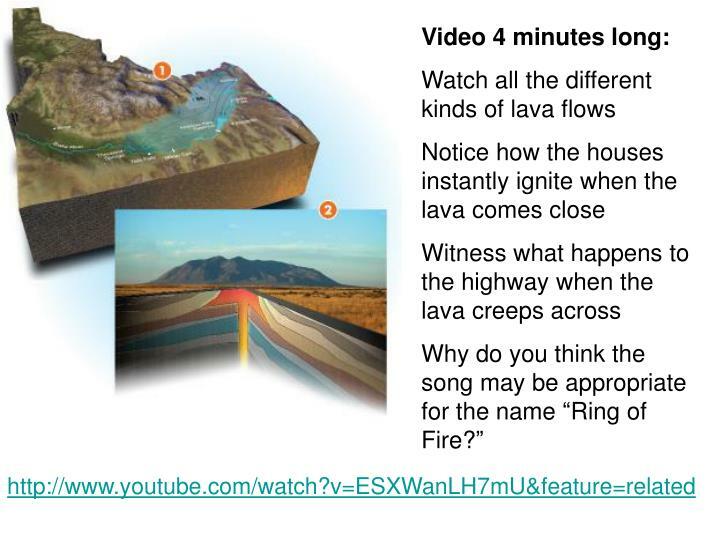 a volcano is like a hill. but it has lots of hot red and orange lava. here is a cross section of a volcano. a volcano. about yellowstone. yellowstone is in usa and people youst it as a family park.